There is a sad truth about the way that most students learn to write: They become boring writers. To write with clarity and insight involves struggle (regardless of age). When faced with this challenge, many students are taught to detach from content, to analyze with sterile language, and to develop ideas within a narrow formula. Structure is helpful, but if not implemented strategically, it can stifle creativity and require students to go through motions rather than investing themselves in creating something. 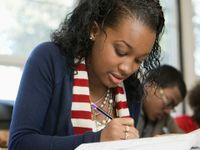 Many of our attempts to help young people develop writing skills actually deter them from the joy and power of developing a unique, insightful writing voice. [T]hink of writing as an organic, developmental process in which you start writing at the very beginning -- before you know your meaning at all -- and encourage your words gradually to change and evolve. Only at the end will you know what you want to say or the words you want to say it with. . . Meaning is not what you start with but what you end up with (15). How can we honor this process and make school writing about discovery? Instead of leading students to feel that school writing must be separate from their lived realities, how can writing allow students to find meaning through a process of creating? At Science Leadership Academy in Philadelphia, where I teach, we adopted common language to help us unify our writing instruction. Throughout the four years of high school, we emphasize thesis statements and the crafting of arguments. While I believe there is much value to this approach, I've also come to believe that we should do more to help young people develop their writing craft. In the book Occasions for Writing, Robert DiYanni and Pat C. Hoy II offer a vision of essay writing which provides a more open structure that I find liberating. They frame essay writing as "mak[ing] something new, something that only you can create," (2) and they encourage writers to go beyond the idea of a thesis: "Rather than simply declaring a thesis in your writing -- something that you intend to 'prove' -- you should be actively inquiring about and developing an idea" (6). This type of essay writing allows writers to use images, experiences, and text as evidence that leads to discovery. By blurring the line of what is acceptable for an academic paper, we allow students to experiment and be creative. Because they become more engaged, they become better writers. And because they are better writers, they are better able to adapt as writing expectations shift within different contexts. Most of these steps are graded for completion in the hope that students are not penalized for taking risks and struggling with large ideas. I want students to see these steps as part of the process of discovery and creation of a polished final product. As it turns out, this experiment with writing instruction helped me develop an idea of my own: How we ask students to write affects their understandings of learning and creation. Let's do what we can to bring more meaning to the work of school by letting students explore ideas, express themselves, and write in organic, innovative, and public ways.